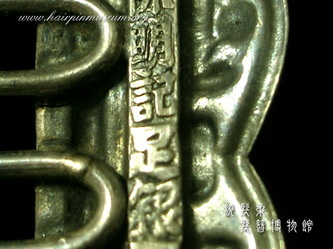 There are several kinds of metals that are used to make hairpins. We can see different metals or alloys with different properies and values used on hairpins. Gold hairpins are very valuable and this noble metal is usually used to display wealth, although it is also a form of money in itself. 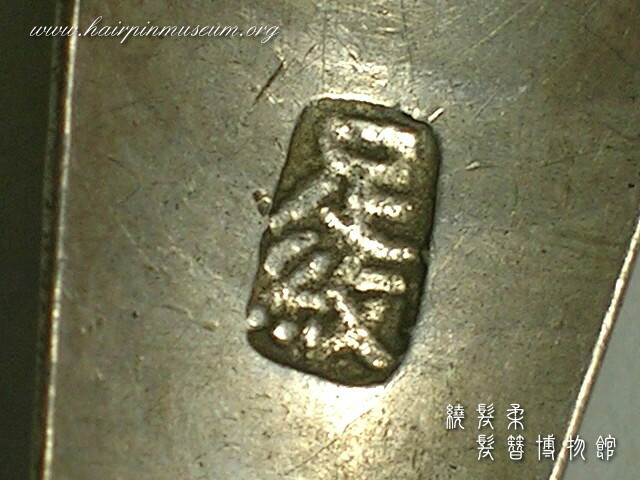 A pure silver hairpin is very shiny but too soft to make practical objects for use. It is usually alloyes with copper to make it harder. Nickel silver - an alloy of copper and nickel - looks like silver but is much harder and cheaper than real silver. Left picture from top：Silver, copper, bronze and nickel silver. In Chinese culture, as in European countries, silversmiths always marked their objects with the quality of the metal or silver. In the pictures each silversmith has stamped the quality of the alloy on the back of the hairpins. 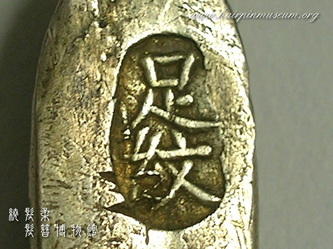 "足紋"(left and centre), "足銀"(right) Both characters mean "pure silver".